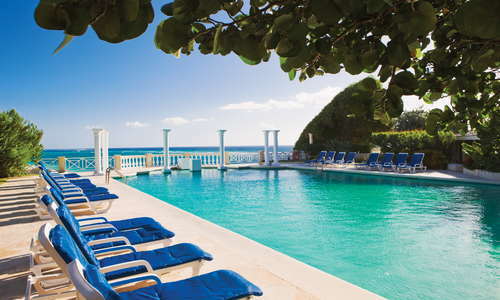 Crane Beach Hotel, founded in 1887 on a seaside cliff near the site of a small commercial port, was the island's first resort and remains the Caribbean’s oldest hotel in continuous operation. The original hotel and the beach at the bottom of the cliff were named for the piece of equipment (a crane) that raised and lowered cargo—not the elegant bird. 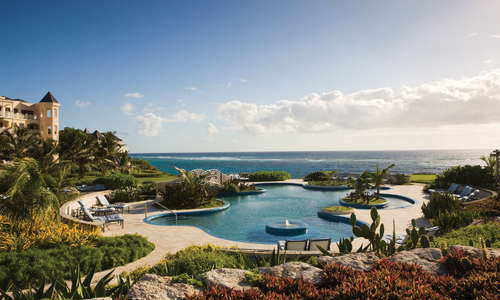 Nevertheless, the bulk of this resort, renamed simply The Crane, has become a luxurious, gated, villa community with five high-rise residential buildings, numerous pools, several restaurants, one of the best beaches in Barbados, even a small village. The Crane Village has 55,000 square feet of retail space with duty-free shopping, a convenience store, a restaurant, a café, a bar, and an art gallery. 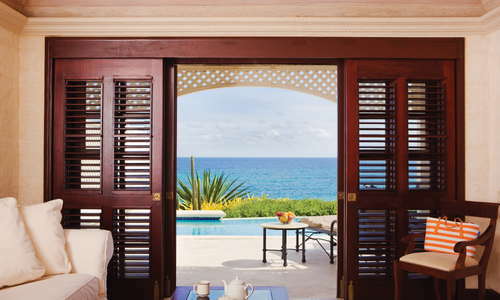 The 18 historic hotel rooms and suites are decorated with original antiques; corner suites have walls of windows and wraparound patios or balconies with panoramic views of the sea. 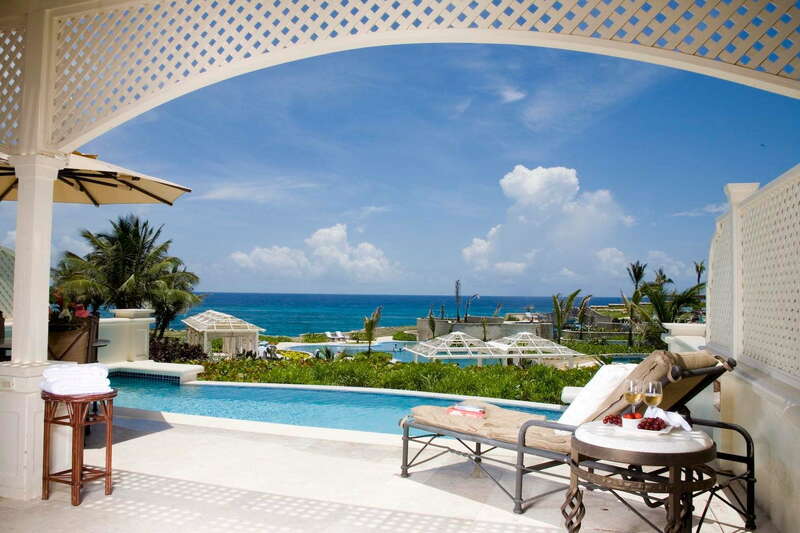 The upscale private villa accommodations are enormous. One- and two-bedroom suites range from 740 to 1,400 square feet for garden view units and 1,176 to 2,885 square feet for ocean-view units. 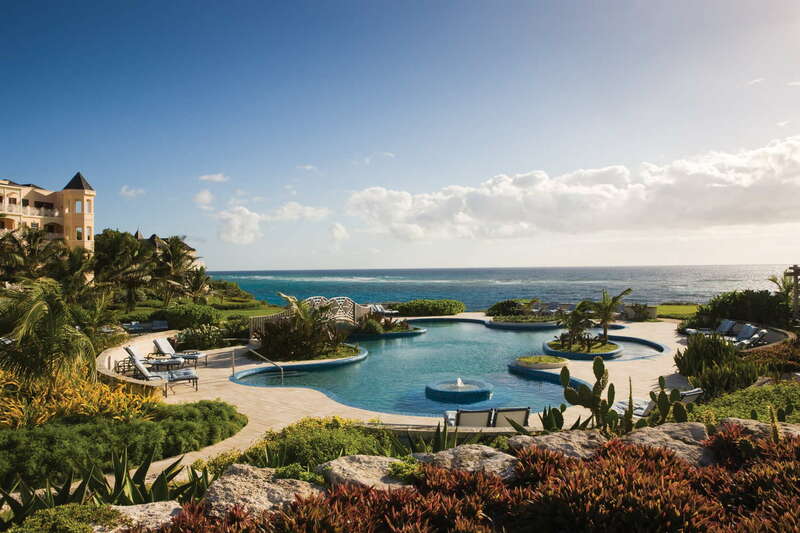 All have coral-stone walls, hardwood floors, mahogany furniture, hand-carved four-poster beds, multiple bathrooms, fully equipped kitchens, and washers and dryers; many have an infinity-edge plunge pool, ranging from 12 to 28 feet in length. 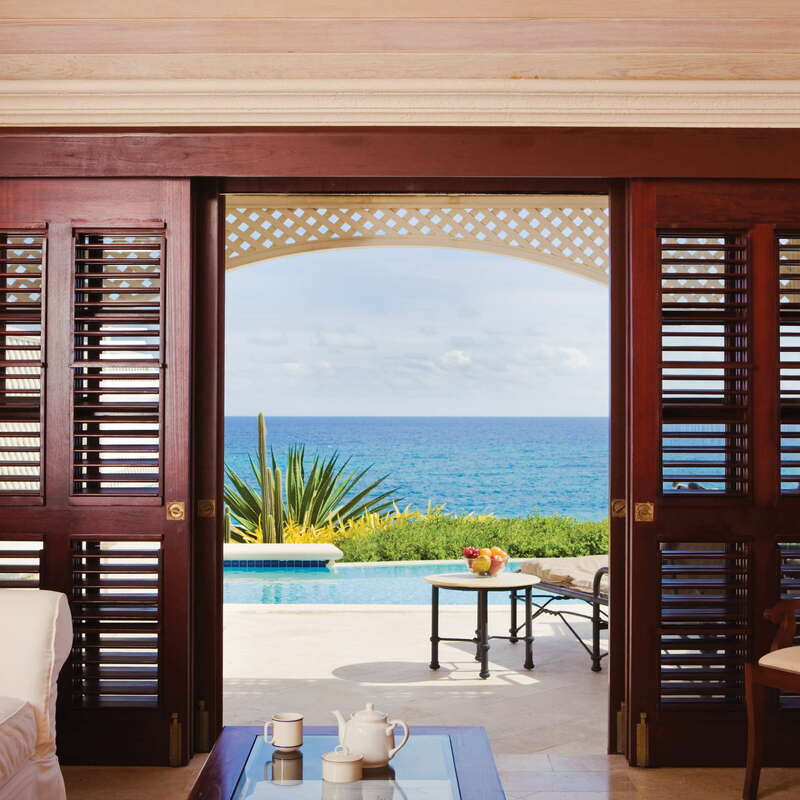 A three-bedroom, ocean-view penthouse suite suitable for eight guests tops 4,000 square feet in size and includes an expansive rooftop terrace with a BBQ grill, plunge pool, and outdoor Jacuzzi. 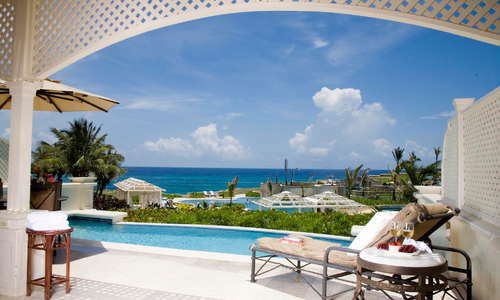 YOU SHOULD KNOW The historic hotel rooms are considerably less expensive than the villa suites. Suites all have en suite bathrooms, each with a Jacuzzi tub, spa shower with multiple shower heads, double vanity, separate toilet room, and large dressing area with a spacious wardrobe. Each suite also has a guest bathroom with vanity, toilet, and shower. The grand lobby, located in the historic hotel, has a large reception desk, plenty of comfortable seating for guests who are coming or going, and a large guest services area for arranging tours and activities. The lobby’s various sections are separated by broad arched openings in the coral-stone walls, creating an open, yet intimate, environment. The Crane offers complimentary international calls, landline to landline. Guests relax, refresh, and renew at Serenity Spa, located within the historic hotel section of the resort. The spa offers a full menu of massages—including a four-hand massage with two therapists—along with facials, body treatments (wraps and scrubs), manicures, pedicures, and salon services. The spa uses ELEMIS products. Romance in the air? Indulge in a three-hour “Couples Journey,” which includes a 60-minute rose petal massage, facial, lunch, and a warm stone mani/pedi—all for two, of course. The 3,000-square foot Fitness Centre has state-of-the-art equipment, lockers and showers, and a personal trainer for private sessions. Yoga and Zumba classes are booked through the spa. The Crane has five restaurants. Azure, which has a panoramic view of the ocean and beach, serves à la carte and buffet-style breakfasts and classic international and Caribbean cuisine at lunch and dinner. At Zen, diners enjoy Japanese and Thai cuisine in a sophisticated, Asian-inspired atmosphere. Within The Crane Village, D’Onofrio’s is a casual family restaurant serving Southern Italian fare, including pizzas, at dinnertime. Nearby, The Village Café specializes in homemade gelato, pastries, and other sweets. The century-old stables has been transformed into The Carriage House, a modern poolside bar and grill serving lunchtime meals and snacks. At The Grove Beach Bar & Grill on Crane Beach, you can have cold drinks and lunchtime treats—grilled hot dogs, burgers and fries, barbecued chicken, kebabs, wraps, and salads. The Sunday Gospel Breakfast at L’Azure is often a sell-out, so reservations are recommended. Bar 1887, located in The Crane Village, serves cocktails all afternoon and evening and, at dinnertime, offers a tapas menu accompanied by live jazz entertainment. Crane Beach is often named one of the best beaches in the Caribbean; indeed, one of the “top,” “best,” or “sexiest” in the world! Perhaps it’s the crescent of powder-soft pinkish sand, or the reef-protected water in various shades of blue, or the cliff backdrop, or the grove of palm trees. 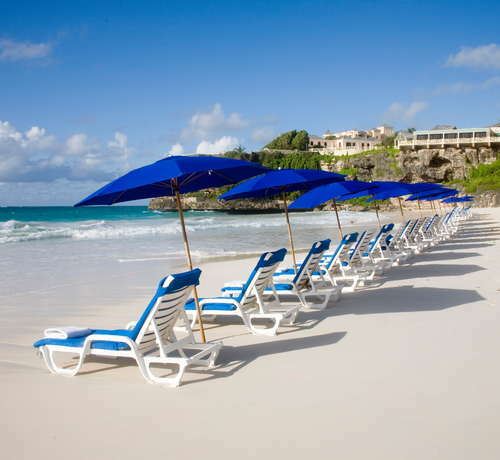 In any event, it’s absolutely beautiful and one of the best swimming beaches on the island. To get to the beach, you have to walk down 98 cliffside steps or take The Crane’s glass-walled elevator. The Beach Hut provides sun loungers, umbrellas, and towels to hotel guests; The Grove Bar & Grill, a beach bar, serves light meals and beverages. A lifeguard, provided by the government (not the hotel), is usually on duty. Bottom Bay Beach—a 10-minute drive east—is another quintessential Caribbean beach and well worth a visit. Broad white sand, turquoise sea, waving palm trees, total seclusion… bring a picnic and your towels, as there are no facilities. While there’s plenty to do at The Crane (or not do, if that’s your preference), a rental car is advised if you expect to spend time exploring the island on your own or otherwise getting away from the resort grounds. Bus service is available, but can be a long, bumpy ride to get where you’re going—even though it only costs $1 each way. Taxis are always available, too, but the frequent use of taxis becomes expensive from this remote area. You’re unlikely to tire of the dining options at The Crane, including preparing a meal or two in your own villa; but if you do want to get out for a meal, it’s quite a jaunt. Most likely, you’d stop for a bite to eat during or after a day touring the island or visiting a particular attraction. 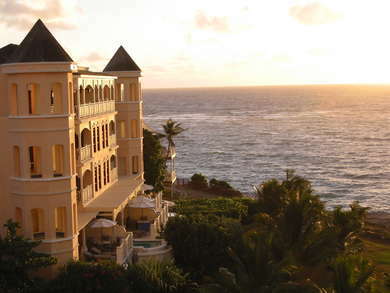 For either lunch or dinner, for example, consider The Atlantis Hotel (45-minute drive) when touring the dramatic east coast; Waterfront Café (45-minute drive) in Bridgetown; The Cliff or Cliff Beach House (45-minute drive) in Durants on the west coast; or The Fish Pot (1-hour drive or more) near the northwestern tip of the island. The nearest nightlife scene is in St. Lawrence Gap, where folks gather at The Old Jamm Inn or Scoopie’s Jazz (30-minute drive) for a lively evening of drinks, music, and dancing. The Crane is a full-fledged resort in an out-of-the-way location. 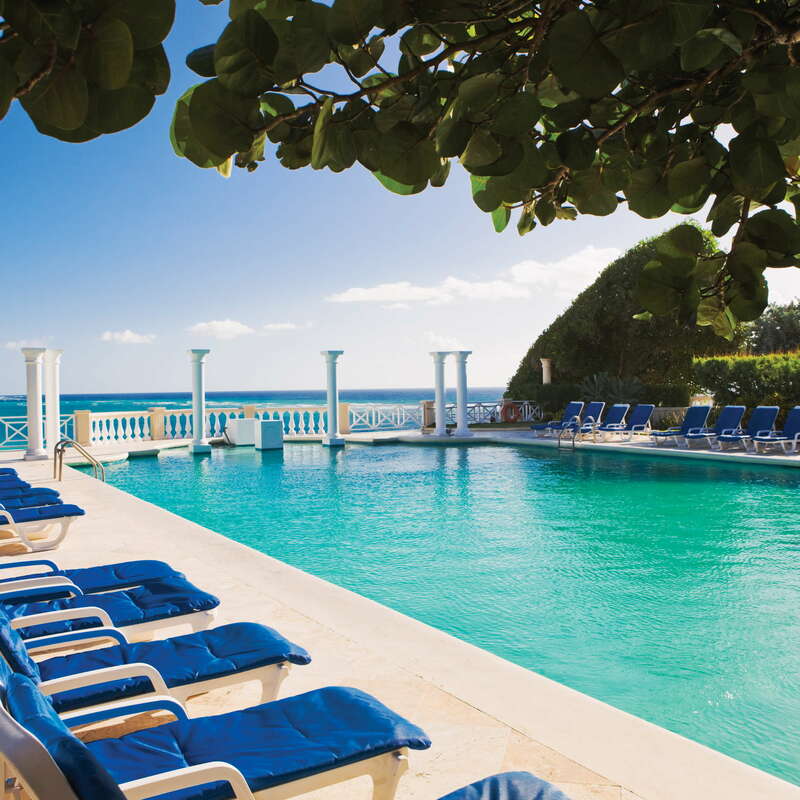 Perhaps because of that, the resort maintains a level of peace and quiet while still having a lot to do—for couples, singles, groups…the whole family. $$$ &middot; Maxwell Coast Rd. $$ &middot; Hwy. 7, Hastings Main Rd. $ &middot; South Coast &middot; Hwy. 7, Hastings Main Rd. $$ &middot; South Coast &middot; Enterprise Beach Rd.